Cook pasta nuggets to desired doneness as directed on package. Drain; rinse with cold water to cool. In medium bowl, combine cooked pasta nuggets and all remaining ingredients; mix well. Cover; refrigerate 30 minutes to blend flavors. Another small pasta shape, such as shells, can be used in place of the nuggets. To reduce the fat in this salad by about 3 grams per serving, substitute light Italian dressing for the regular. To save time in the kitchen, look for carrot strips or thin carrot sticks in the produce section of the grocery store. They are sometimes stocked in the salad bar; pack them to take through the checkout line just as you would a salad. 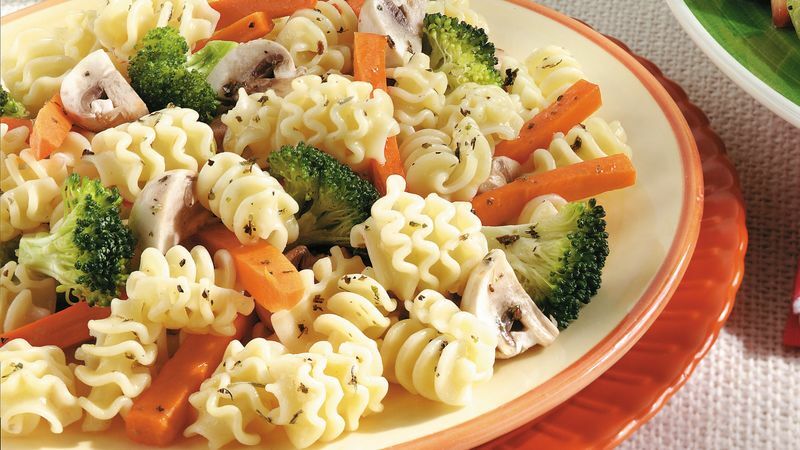 To give the broccoli a beautiful brightness, add it to the pasta and water during the last 2 minutes of cooking time. Drain and rinse it with the pasta.